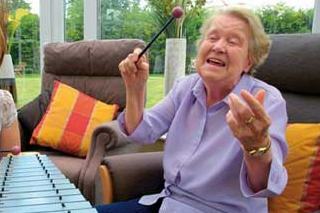 A therapeutic music-making group for seniors and their families. Two of our MTs will orchestrate this 60-minute group into a dynamic event for your community. Weekly or monthly large group sessions for up to 15 seniors (8-10 for memory-care settings). This therapeutic group will enhance non-musical skills of each participant and provide an excellent social opportunity. Small group sessions for 6-8 residents. These are typically offered in 6 or 8 week sessions. This therapeutic group will enhance non-musical skills of each participant. Individual or family sessions offer personalized opportunities. Music therapy heightens the ability to focus, engage and participate for individuals with various dementias, including Alzheimer’s. Music therapy can be also be a valuable tool for stroke rehabilitation and the treatment of Parkinson’s disease. Music therapy can be complementary to physical therapy (PT), occupational therapy (OT) and speech-language therapy (SLP). This service is appropriate for motor, speech/ language, and cognitive rehabilitation.